Americans are becoming more aware of their environment and the impacts of carbon footprint. Therefore, they have started opting for eco-friendly products. Consumers prefer environment-friendly household items to ensure a healthy lifestyle. You may have seen a sudden surge in the popularity of organic mattresses within the last decade. Many natural mattresses in the US are non-toxic and have low Volatile Organic Compound emissions. Besides, the organic mattresses are free from pesticides and fertilizers. Thus, giving you a pure healthy sleep surface to rest on every night. The chemical-free, plant-based substances promote a variety of health benefits. They are suitable for consumers with skin allergies. In the sleep products industry, you’ll come across numerous brands offering sustainable natural and organic mattress. But which ones are the most popular and offering quality performance? 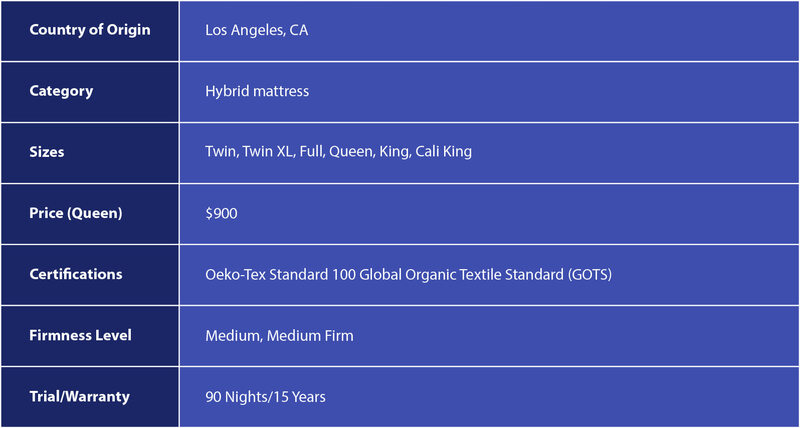 To make mattress shopping easier for you, we are listing the top 8 best organic mattresses that people are crazy for these days. Zenhaven mattress is a popular natural latex bed offered by Saatva. Made of the finest quality latex, Zenhaven is a high-end, durable, and cooling sleep surface. It is a 10 inches thick, four-layered mattress. The brand engineers use American Talalay latex in Zenhaven construction, providing resilience and softness. The mattress cover is made of organic New Zealand wool with superb moisture wicking properties. Zenhaven bed has remarkable bounce and responsiveness coupled with the contouring of foam. Thus, when you lie down, you instantly feel a plush cushioning support but no sinkage. The five-zoned support further adds to the incredible advantages of sleeping on Zenhaven. The hypoallergenic raw organic materials used in Zenhaven are naturally resistant to microbes, dust, and molds. Besides, the mattress is free from chemicals that potentially harm the environment. All in all, Zenhaven is a viable choice for customers with skin allergies or similar issues. Read our Zenhaven Mattress Review for more information. Eco Terra Latex by Eco Terra, is an environment-friendly hybrid mattress. The bed is made to ensure a naturally deep and comforting rest. 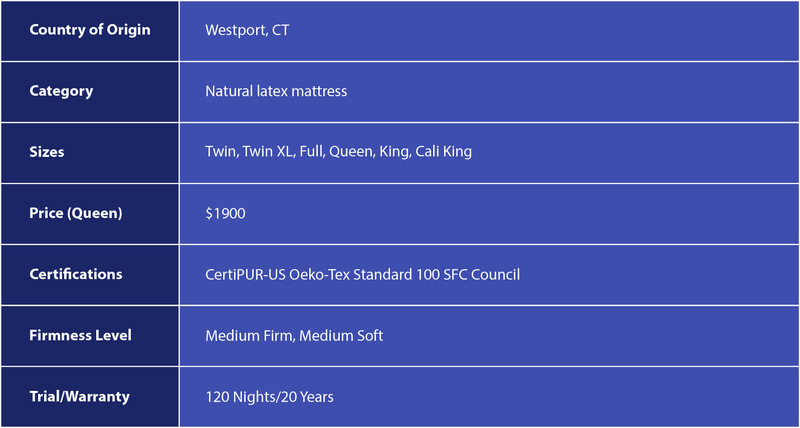 The Eco Terra company is among the best natural mattress brands in America. The 11 inches thick two-layered structure offers a perfect combination of bounce and contouring support. The layers adjust to your figure well and help to conform to your body curves. Thus, whichever sleeping position you assume, your body experiences incredible pressure relief. Eco Terra uses plant-based foam in the natural latex, taken from the sap of rubber trees. Natural latex has the ability to provide you with a healthy, cool, and cradling feel. Besides, the raw organic materials wards off microbes and allergens. So you can rest deeply on a hypoallergenic surface. 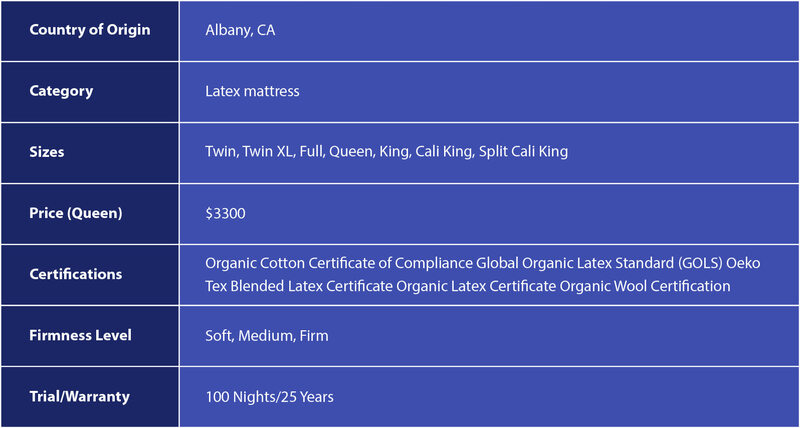 Overall, Eco Terra latex hybrid is a low-cost organic mattress. It is an excellent choice for customers who are seeking a budget-friendly natural bed. Read our Eco Terra Latex Mattress Review for more information. Spindle is a natural latex mattress offered by an emerging online brand called Spindle. 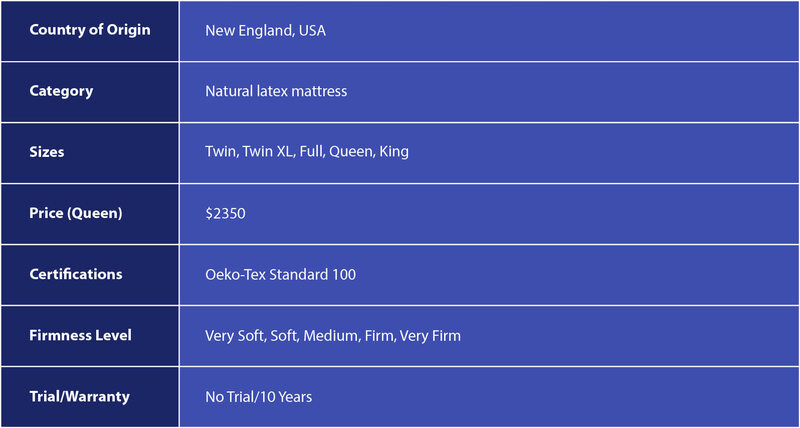 Through customization, you can select the proper firmness level to suit your physique and sleeping style. The plant extracts used in Spindle are harvested from the rubber trees in Guatemala and the Asia Pacific. The company then gets it manufactured in Pennsylvania. The organic mattress cover of Spindle is made from the crops grown in India, Texas, and New Mexico. Later on, it is manufactured in the factories based in Carolinas. The wool for the plush batting is taken from sheep raised in the Pacific Northwest and carded in California. It has the ability to keep you chill and wicks away the heat and moisture. 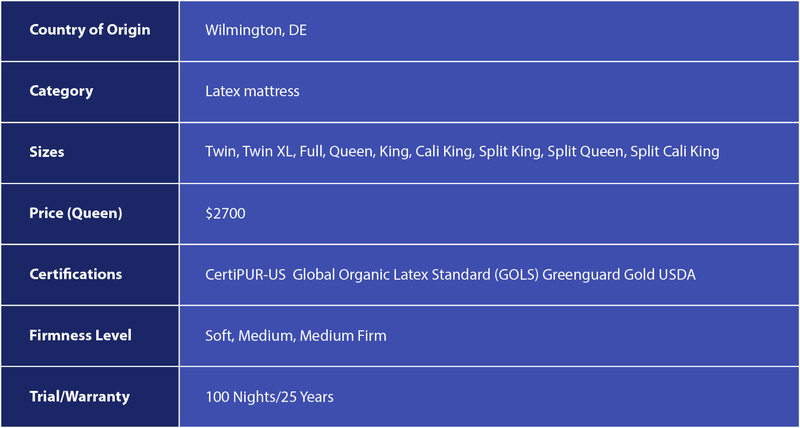 Spindle may be a pricey bed but compared to the retail store natural latex mattresses, the customers can easily save up to $1000! Spindle is definitely worth checking out if you seek a super comfy and cozy organic mattress. Read our Spindle Mattress Review for more information. Avocado Green is a pure natural hybrid mattress, utilizing high-end organic materials. Avocado is a relatively newer name in the bed industry. However, with their quality green sleep products, they have gained instant popularity among people who love an organic lifestyle. If you prefer a high-end hybrid made with exceptional quality latex and hypoallergenic materials, Avocado Green is a perfect choice. The manufacturers use 100% natural latex, combined with cooling Joma wool. The entire mattress is covered with an organic cotton fabric. All materials are super cool, comfortable, pressure relieving, and prevent the development of skin allergies. 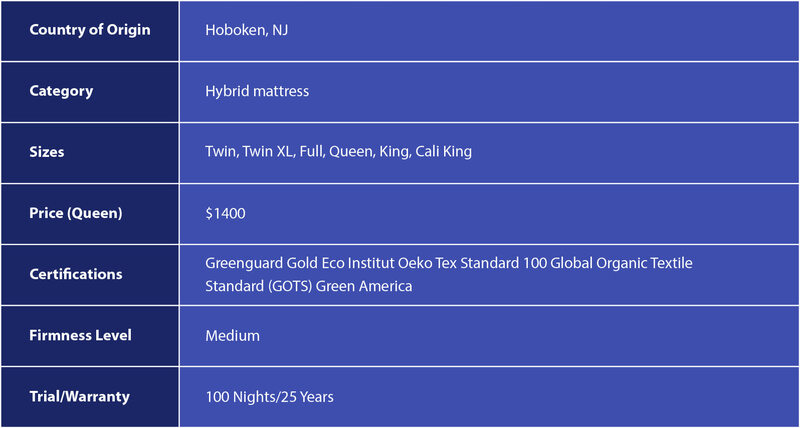 Conclusively, Avocado Green is among the best affordable mattresses — a definite must-have! Read our Avocado Mattress Review for more information. Happsy Organic is an eco-friendly and hypoallergenic hybrid mattress. It is designed and produced by the brand by Happsy, a revolutionary bed-in-a-box company. 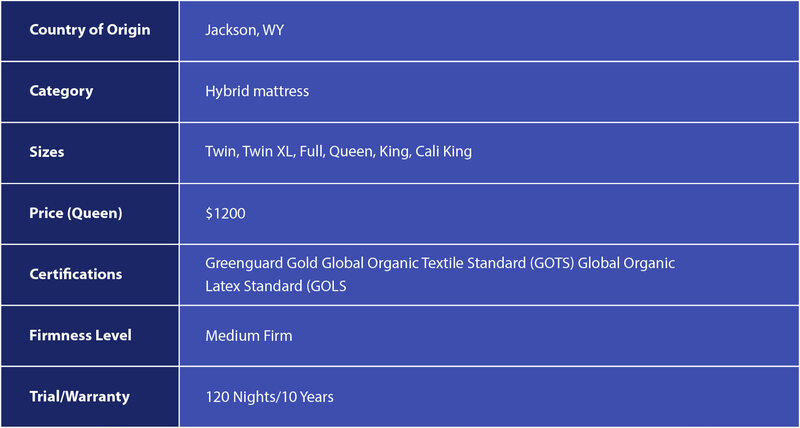 You may visit their showroom in Jackson, WY to check out their sleep products. The bed comprises organic latex and organic mattress covering, coupled with pocketed coils for flexible support. Overall, the mattress provides exceptional comfort on a surface made in the US using domestically sourced materials. Happsy makes premium quality beds, completely organic in nature. Their merchandise is free from environment and health disrupting chemicals and flame retardants. If you want a bed with low VOCs, Happsy is one of the best mattresses without off-gassing. Read our Happsy Mattress Review for more information. The Q3 Organic Latex bed is offered by Nest Bedding, a popular brand known for their high-end and quality designed sleep products. They sell the beds and bedding items on both online and offline platforms. Nest Bedding utilizes the best organic latex material to give you a healthy and supporting sleep experience. The eco-friendly wool, cotton, and latex combination ensures you rest on a cool and comfy surface all night long. If you are prone to allergies and skin reactions, Nest Bedding Q3 Organic latex might just change your life! The luxuriously handcrafted merchandise by Nest Bedding is worth checking out — especially if you are all for a holistic lifestyle! Read our Q3 Organic Latex Mattress Review for more information. Live and Sleep is a well-known sleep essentials brand. They have quickly gained a massive clientele because of their charitable humanitarian projects and eco-friendly sleep products. Live and Sleep Classic mattress is a natural memory foam sleep surface. This medium soft bed is perfect for a rejuvenating night’s rest that promotes pressure relief. The brand utilizes relatively fewer chemicals in their memory foam mattress giving it a natural and eco-friendly feel. All in all, Live and Sleep Classic mattress is among the best affordable mattresses. It is a healthy choice for consumers who are concerned about the carbon footprint. Read our Live and Sleep Classic Mattress Review for more information. PlushBeds is one of the best mattress brands, well-known for their high-end natural bed and bedding items. The Botanical Bliss mattress by PlushBeds is one of their finest organic sleep products. If you are looking for a luxurious, pure organic bed, the Botanical Bliss mattress is a viable option. Combining environment-friendly materials with the latest sleep technology, you can enjoy a healthy sleep experience on this bed. It is super relaxing, comfortable and supports all your body curves. Botanical Bliss comprises 100% natural Talalay Latex foam, free of chemicals and fire retardants. The cover is made of organic cotton providing a plush feel. 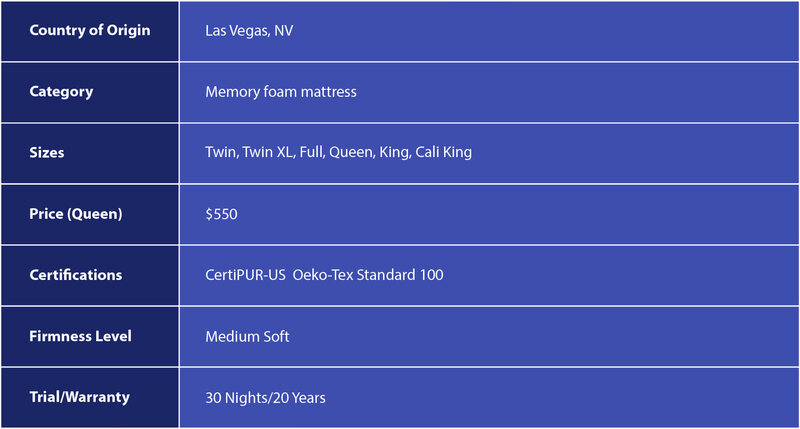 PlushBeds mattresses are a bit pricey but overall offer remarkable value for money. Read our PlushBeds Botanical Bliss Mattress Review for more information.